I have a Canon 5D Mark II. I notice that using AV or TV mode that the meter sets itself to an "average" grey automatically smack in the middle. But using Manual mode, it fluctuates alot no matter what metering i.e. evaluative, spot etc, setting i use. Is using AV or TV mode more dependable on getting a "perfect" average grey, since it sticks very well right in the middle of the meter? Of course i would only use that as a starting point for really bright or dark subjects. I notice that using AV or TV mode that the meter sets itself to an "average" grey automatically smack in the middle. But using Manual mode, it fluctuates alot no matter what metering i.e. evaluative, spot etc, setting i use. With Av or Tv modes, the camera adjusts shutter speed or aperture, respectively, to achieve a good exposure based on the metering mode you've chosen, so the meter normally shows a reading right in the middle of its range. With M mode, you're in control of all the parameters (shutter speed, aperture, and sensitivity), the camera tells you what the meter says without trying to change any settings to compensate. You're free to adjust any of those parameters to get the meter to read +/-0EV if you want to, just as the camera would do in one of the automatic modes, but you're obviously also free to use your own choices for those parameters even if the meter tells you that it's reading more or less light. Your camera provides a number of tools for working with the metering system. As described above, manual (M) mode puts you in total control. In Av, Tv, or P modes, you can use the AE-lock function to get the camera to pick settings based on the current metering mode, and then lock those settings in so that you can reframe without having the settings change even if reframing the image makes the meter read something else. You can also use exposure compensation to make the camera choose settings that make the image darker or lighter than it would otherwise, basically telling the camera "yes, I really do want the image that bright." Is using AV or TV mode more dependable on getting a "perfect" average grey, since it sticks very well right in the middle of the meter? Av and Tv are more dependable if what you want is a reasonable exposure, and those modes are more effective when you get the hang of using AE-lock and exposure compensation because those tools give you a greater ability to tell the camera what you want while still letting it adjust for changing lighting conditions. M is more reliable if what you want is to not adjust for changing lighting conditions, or if you're working in conditions that would confuse the auto exposure system. In automatic modes the scale is not displaying exposure. It's instead showing you the amount of exposure compensation you have dialled in. Only in manual mode does it actually work like an exposure meter. So if your exposure compensation is set to zero the meter will not move at all. The meter reading is fluctuating in the automatic modes. It's just not being displayed, except that you can see the shutter speed and/or aperture changing. When in manual mode, the meter changes if the amount of light being metered changes. 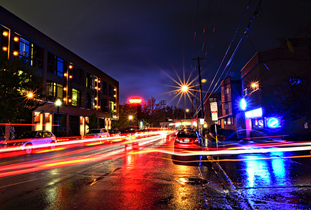 This can be due to camera movement that includes more bright or more dark areas in the part of the scene being metered. To compensate you need to manually change either the shutter speed. aperture value, or ISO. When you have modified the exposure settings to allow proper exposure, then the meter will indicate such by returning to the middle. When in an automatic mode, the meter indicates your instructions to the camera regarding exposure. If the amount of metered light changes, the camera automatically alters one of the exposure parameters (Tv, Av, or ISO) to compensate in order to maintain proper exposure. If you are in Tv mode, you have selected a particular shutter speed and the camera will adjust the aperture and/or the ISO (if the aperture is at maximum, either Auto ISO or safety shift is enabled, and exposure is still too dim). If you are in Av mode the aperture will remain at the setting you have selected but the camera will alter shutter speed and/or ISO to compensate. Note that even when shooting in an automatic mode, if the scene becomes so bright or so dark that the camera can't compensate enough to maintain proper exposure, the meter will move to indicate over- or under- exposure. Suppose you are in Av mode and have selected f/1.4 using your EF 50mm f/1.4 lens in bright, direct sunlight. Even at your camera's minimum shutter speed of 1/4000 second using the camera's minimum ISO 100 the scene will probably still be too bright. In such a case the meter will move to show overexposure. Or suppose you are in Tv mode and have selected a shutter speed of 1/1000 second but the light is so dim that even at your EF 70-300mm f/4-5.6 lens' maximum aperture of f/5.6 at the selected 300mm focal length and the selected sensitivity of ISO 400 (with Auto ISO and safety shift disabled) the metered scene will still be underexposed. In that case the light meter in your viewfinder will move to indicate the underexposure. Using manual, even the slightest movement of the camera causes the meter to fluctuate (even using evaluative). This isn't as dependable as using one of the "auto" modes as AV. Because it can easily be thrown off by a bright patch of light in one small area of the scene. So, a truer middle grey is only achieved using the T.V. or A.V. modes since all of the darks, lights are distilled down to grey. The meter shows that. I understand having more control and freedom using manual mode, it's more like using a spot meter to find your middle grey in a jumble of tones though. I still like manual though because it locks the aperture, shutter speed once you do get the right exposure. Not the answer you're looking for? Browse other questions tagged canon canon-5d-mark-ii or ask your own question. What is the difference between AI Focus and AI Servo autofocus modes? How should I learn to understand Canon's metering? What is the difference between canon 5D mark II and mark III? How significant is the difference between Canon 5D and Canon 5D Mark II when using the same lens at open aperture? What are meaningful deciding factors when deciding between Canon 5D mark III vs mark II? Difference between Canon cameras and lens? How significant is difference in dynamic range between Sony A7 and Canon 5D Mark II? Canon SX240HS: Worth using modes other than Auto?